For years, the nation’s best rowers competed at Harsha Lake at East Fork State Park. As the rowing facility declined, though, premier racing events went elsewhere. Now Clermont County officials are awaiting word on whether they’ll receive state money for an upgrade that they say could bring those events back and provide an economic boost to the county and state. State Sen. Joe Uecker, R-Miami Township, has submitted a $3 million request. It would pay for, among other things, an overhaul to the starting dock and course acquired from the 1984 Olympic Games; improvements to launching and recovery docks; enhanced boathouse facilities; new spectator viewing areas; a new bathhouse and concession; and a finish tower for use by race officials. Lack of money might sink the project. He noted that not all the needed money must come from the capital budget. Some could come from an agency such as the Ohio Department of Natural Resources. The U.S. Army Corps of Engineers owns most of East Fork State Park and leases it to ODNR. Smith noted that money could also come through private fundraising and corporate contributions in the form of sponsorships. Harsha Lake was created for flood-control purposes. As a rowing venue, its popularity peaked in the mid-1990s when it hosted regional and national races that drew thousands of competitors and spectators. The lake was perfect for racing: still water with no shifting currents to bother rowers, ample staging room and a straightaway that could accommodate the length of an Olympic 2,000-meter race. “East Fork State Park is widely acknowledged as the finest natural rowing course in North America,” said Mount Lookout attorney and rowing coach Paul Schmid, a board member of the Clermont CVB. But by the mid-2000s, the rowing facilities had fallen into disrepair. 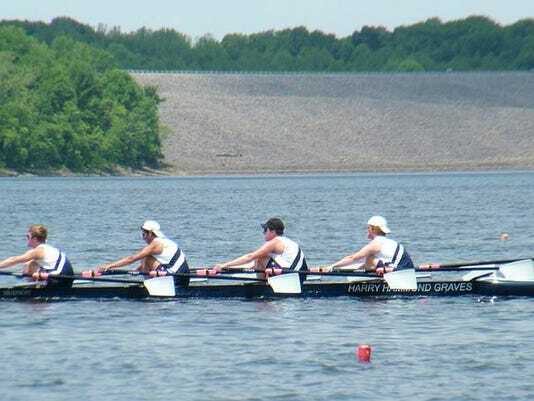 After the 2010 season, U.S. Rowing chose to move its Youth National Championships to Oak Ridge, Tenn. The following year, a flood caused significant damage to the bathhouse, concession area and restrooms. In 2012, the Midwest Scholastic Championships pulled out. Four regional rowing events are still held at the lake annually. Schmid drafted a white paper, in cooperation with the Clermont CVB and county commissioners, that highlights the project’s potential economic benefits. It says a typical rowing event draws about 1,500 participants, with total attendance, including family members and spectators, of about 5,000. That would translate to about 2,100 hotel rooms booked over a weekend, or about $420,000 in hotel revenues. Those hotel bookings, along with discretionary purchases, would generate roughly $82,000 in lodging taxes and sales taxes for one event, according to Schmid’s report. “If you could capture half a dozen race events, you would have at least a half-million dollars in (tax) revenue (a year),” Smith said.